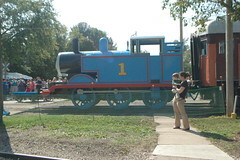 The family went and saw Thomas the Tank Engine today. The boys had a lot of fun. The had a lot of activities for the kids to do while waiting for Thomas. 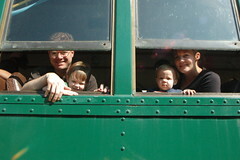 The actual train ride was less than 30 minutes, but it was long enough. The expressions on the boys faces was precious when the train first started to move. Their eyes got really big as the train slowly moved away from the train station. There were a lot of other families to visit Thomas as well. We ran into two other boys named "Ean" which really surprised mom. The weather was pretty great too. If you ever get the chance you'll need to ask Jayne about what Ean said when he first saw Thomas pulling up into the train station. It was pretty cute.